Secretariat’s victory in the Preakness was every bit as impressive as his Derby victory, but accomplished in a spectacularly different way. Instead of waiting, and then asking his horse to make one long, sustained drive for the finish, as he had in the Derby, jockey Ron Turcotte surprised a record Preakness crowd with a sudden, lightening move from last to first to seize the lead early in the race. Out of the gate, Secretariat dropped back to the back of the small, six-horse field. That’s where everyone expected him to be. But they didn’t expect what happened next. Turcotte, sensing the pace was slow, was not about to allow the leaders and especially rival Sham to dawdle along and have plenty saved for the end. As the field settled into the first turn, all hoping to relax for the long 1 3/16th miles race, Turcotte made his daring, early move, from last to first, three-wide and rolling. Turcotte’s bold move was meant to seize the moment, place the destiny of the horse in his own hands. But it was risky. An early speed burst might bite into the colt’s well of stamina. Rival riders poised to reel in Big Red in the latter stages, if he faltered. However, there was no falter in Secretariat. Down the backstretch Secretariat loped along on the lead. Around the turn and into the stretch he held about a 2½ length- margin on Sham (who had moved up to second) and held that margin to the wire. 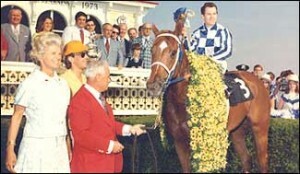 As he had earned the roses in Louisville, Secretariat was awarded black-eyed susans for victory in Baltimore. It was smiles all around in the Secretariat camp. But there was one small problem with the race: its time. After breaking the Derby time record, sportswriters were keen to see if Secretariat could break Canonero II’s 1:54 for the 1 3/16th miles Preakness in 1971. A time of 1:55 glowed in the lights of the electronic timer in the infield. That was far from the final “Official” time of the race. 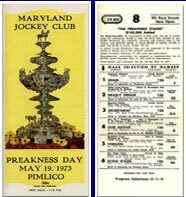 Minutes after the race, the track’s clocker informed Pimlico officials that he had timed the race faster than the timer, with a clocking of 1:54 2/5. Also speaking up were two Daily Racing Form clockers, both veterans, who both had timed the event in 1:53 2/5 which would have broken the track record. In the days following the Preakness, CBS television entered the controversy and offered to allow officials to time the race on a video-tape replay. The network showed fans side-by-side replays of Secretariat’s Preakness and Canonero’s Preakness, and Secretariat got to the line first on TV. Finally, the Maryland Jockey Club decided to toss out the electronically-recorded time, and go with the Pimlico’s clocker’s 1:54 2/5 as the official time. The Daily Racing Form felt so strongly about the discrepancies that it noted both the new official time and its own clocking: 1:53 2/5. 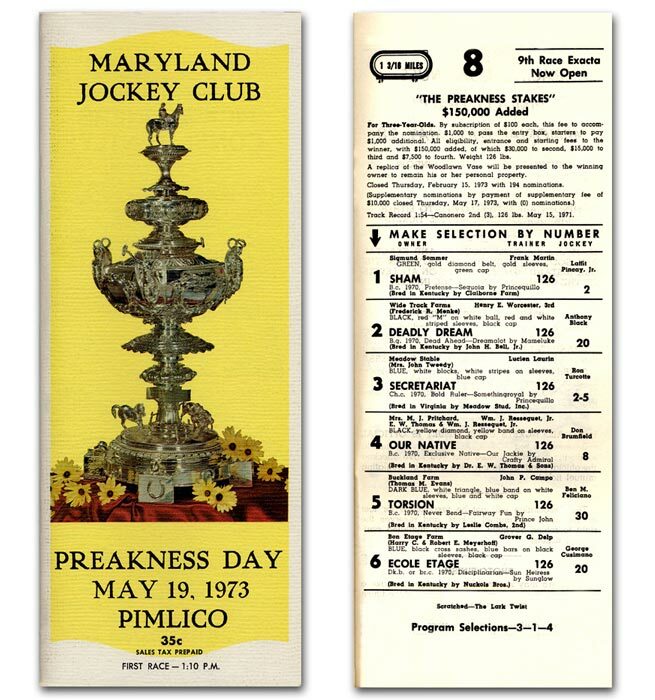 The disputed time would linger for another 39 years until the Maryland Racing Commission officially corrected the time to 1:53 flat, settling the issue once and for all. In 1973, the time controversy remained in the news in the days leading up to the final leg of the Triple Crown three weeks hence, the Belmont Stakes at Belmont Park in New York. But most fans’ attention was riveted only on Secretariat. Since the great Citation last did it in 1948, no horse had been able to capture all three Triple Crown races. If ever one could, it had to be Secretariat.